She has just issued from her palace, when Death unexpectedly appears and forcibly drags her away. Her jester, in whose habiliments Death has ludicrously attired himself, endeavors in vain to protect his mistress. A female attendant is violently screaming. 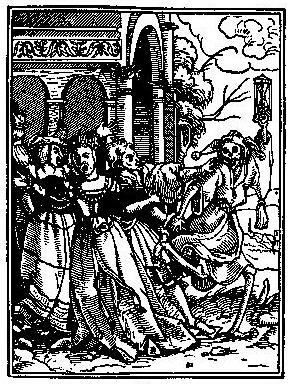 Death holds up an hour-glass to indicate the arrival of his fateful hour.